I love generic fantasy miniatures, especially evil ones; they are just so versatile. Take this guy, for example. I would have no qualms about using him as an adversary to my Greek Heroes, my Warhammer 40K Inquisitors, or my Dwarf adventurers. Heck, he wouldn’t even look too out of place, rising up to threaten my Confederates. 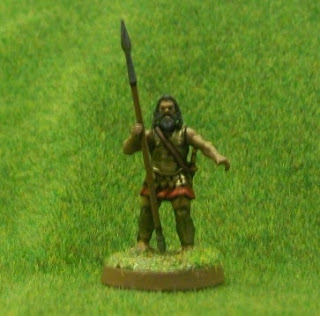 This guy comes from Reaper, and I think I picked him up at the Orc’s Nest in London. He was exceptionally easy to paint, just a base coat and a whole lot of dry brushing. It's a real delight when so little work, returns such a nice looking figure. I believe he’ll be a menace for many years to come. Confined, both morning and afternoon, to the bus, by my still mending shoulder, I do my best to pass these wearisome rides with a bit of enjoyable literature. 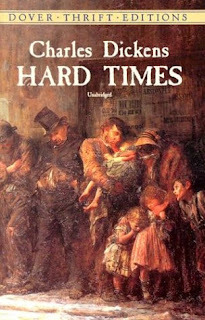 My current book of choice is Hard Times, the shortest, which is not to say short, novel by Charles Dickens. Previously, my acquaintance with this man of letters has been brief: a couple of readings of A Christmas Carol, which I thoroughly enjoyed, and a force-feed helping of Great Expectations, which I most certainly did not. After a week of bumpy rides, I am halfway through the book, and, despite its somewhat wandering plot, I am enjoying it. Dickens had such an uncommon gift with words that it is easy to see why his works have survived, while most of his contemporaries have been forgotten (like so many of the words that Dickens uses!). There is one sentence in particular that I thought proved a great example for the joys and trials of reading Dickens, which I thought I might share with you all now. Wow. I have no doubt that some literary critics could write an entire essay just on that one sentence. Personally, I have just a few points to make. The first reaction by most modern readers will almost certainly be to the sentence’s extraordinary length. Although I’ve seen longer (thank you James Fenimore Cooper), it is still an impressive work, containing, as it does: 17 commas, 4 semi-colons, and 2 dashes. I have little doubt that any student who tried to turn in such a sentence in an essay or school paper would draw the ire of the red-pen and be told-off for using a ‘run-on sentence’. Certainly such writing is no longer in vogue, in fact, his use semi-colons is most curious. I remember a brief note from school that a semi-colon can be used in place of a comma, where the use of a comma might cause confusion, but I only ever saw this applied to lists, and never in fiction. Leaving length and punctuation aside, it is a tremendous sentence. In the first half, he paints a portrait of a horrible mill town in such imaginative strokes, that I almost felt myself choking on the smoke pouring out of the mill chimneys, while the ugly brick walls closed around me. In fact, I got so caught up in this description, that when halfway through the sentence, he makes a grim joke about the population, I was momentarily lost. Upon further reading, I believe the whole sentence is really one grim joke. He goes on for line after line, clause after clause, about the town, before, finally, introducing an important character, with only a single, semi-useful fact. Stephen Blackpool is forty. He might have well have said that Stephen Blackpool is grist in the mill, except that he's writing about woolen mills. Well, that’s thirteen sentences I just spent, talking about one by Charles Dickens. I suppose that says something pretty important right there. 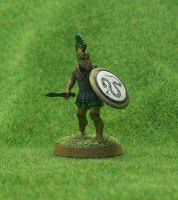 Over the last few months, I have been reading a lot of Ancient Greek Myth, so it is not terribly surprising that I got a hankering to paint up some Greek heroes. 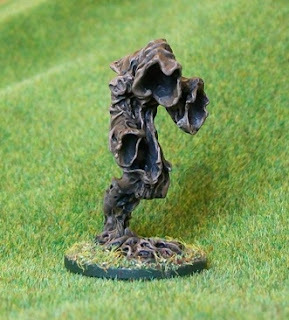 I spent several weeks researching the various miniatures available and deciding exactly what I wanted. 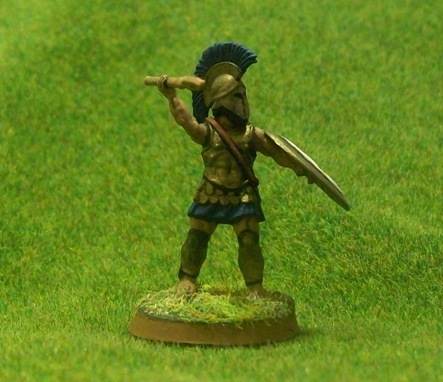 Since my love of Greek myth mostly comes from the old Hollywood flicks, Jason and the Argonauts and Clash of the Titans, I am more interested in recreating the look of these films than I am in historical accuracy. Thus, I decided I would base my heroes on Greek hoplites, even though these warriors actually date to many hundreds of years after the Heroic Age of Greece. 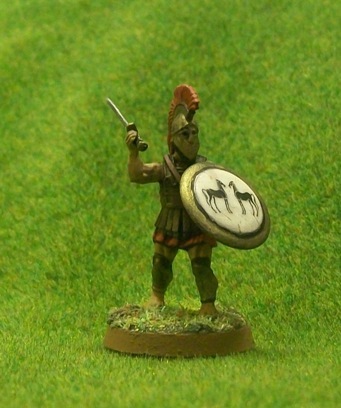 After much searching, I finally decided to go with the Greek hoplites put out by Wargames Factory. I have had my differences with WF in the past, but these figures ticked a lot of boxes. They have nice details, most of which are pretty crisp. Since the arms, heads, and weapons are all separate, there is room for a lot of variation among the figures. 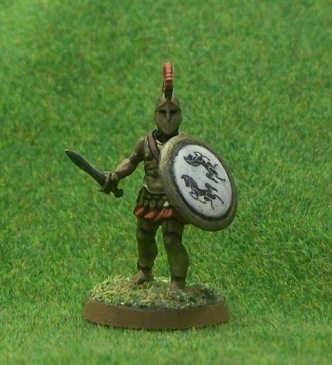 Also, unlike hoplite figures from most other companies, these figures are easy to assemble in heroic action poses. My only real complaint about the set is the lack of head variation. There are only three different head types in the box, and all of them have helmets. Then again, I want most of my figures to be wearing helmets and I found some suitable no-helmeted head replacements in my bits box, so I guess it wasn’t that big a deal. As I was painting the figures, I thought about their story. What brought these guys together, and for what do they fight? I like my heroes to be just that – the good guys, but I needed a higher purpose, something that could hold them together and give them direction. Well, in Greek Myth pretty much everything revolves around the will of the gods, and of these immortals, there is only one that strikes me as generally being good: Athena. As the goddess of wisdom and war, Athena is the perfect patron for a group of wandering heroes. Thus I named my heroes ‘The Warriors of Athena’ because they travel the world at her prompting, fighting monsters, defending the weak, and generally doing all of that A-Team/Magnificent Seven type stuff. I’m not sure if this is the final team line-up. 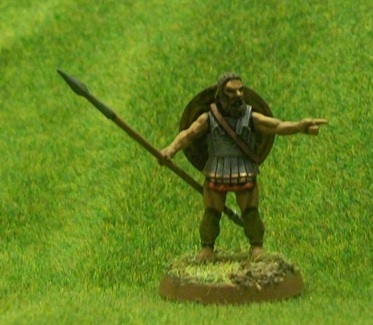 I suspect it may change over time as I paint up new figures and retire old ones. 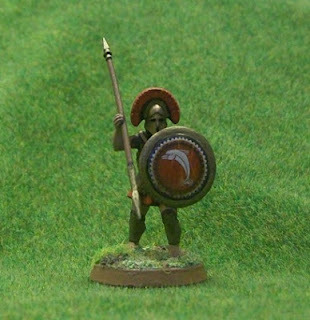 I’d like to add a centaur to the mix and maybe a warrior woman. 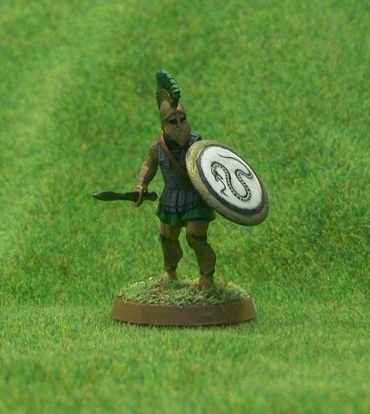 I also plan to get an Athena figure at some point for those times where the goddess decides to directly intervene. Now that I’ve got my team together, all I need is some baddies for them to fight! Special shout out to Little Big Man Studios whose shield transfers add so much to the figures. Before I became the proud owner of a stove with a non-functioning ignition switch, I never gave a lot of thought to the topic of matches. However, over the last year of cooking, I’ve discovered that not all matches are created equal. When I first started using matches, I bought long-stemmed cooking matches, because that is what was on the shelf at the grocery store. However, it soon occurred to me that I might be way over paying for these ‘fancy’ matches. Instead, I started buying matches from my local shop and newsagents, who stock them mainly for smokers. These little boxes cost about 1/6 to 1/8 of the price of cooking matches. True, they are much shorter stems, but they are still long enough to light several eyes on the stove. 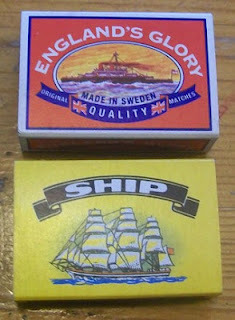 There are two brands of matches that seemed to be carried in the shops around here: England’s Glory and Ship. For several months, I used England’s Glory, but after picking up my first box of Ship, I think I’m a convert. Ship matches are about £0.10 more per box, for an equivalent number of matches. What makes them so much better is how much easier they ignite. With England’s Glory, I often had to strike the box a couple of times to ignite the match, and occasionally broke off the match head. Also, by the time I was down to the last couple of matches in the box, I’d pretty much worn out the rough strip on the side of the box. Ship matches on the other hand, ignite with only the gentlest pressure. Also the box has strips running on both sides, encase one wears out. According to the boxes, both matches are manufactured in Sweden, though England’s Glory gives a UK address in High Wycombe (pronounced ‘whickem’) , just down the road in Buckinghamshire. While England’s Glory is slightly cheaper, and comes in a more attractive little box, it is not enough to make up for the much better quality of Ship.